myTuitionScore: What's your tuition score? Find out now! A whole new approach to college planning. 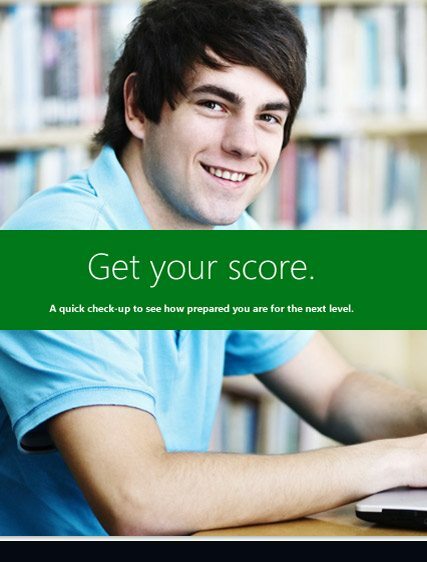 MyTuitionScore is a unique and comprehensive preparation tool for the college process. Your tuition score and report represents knowledge, preparedness, and financial health relative to the college investment. Are you sure you're choosing the right school? Get school recommendations based on your specific needs. Go-getters like you are one of a kind. The completely personalized MyTuitionScore Report is as unique as you are. Our report tells you if your college ROI (Return on Investment) will pay off. One wrong choice could cost thousands. 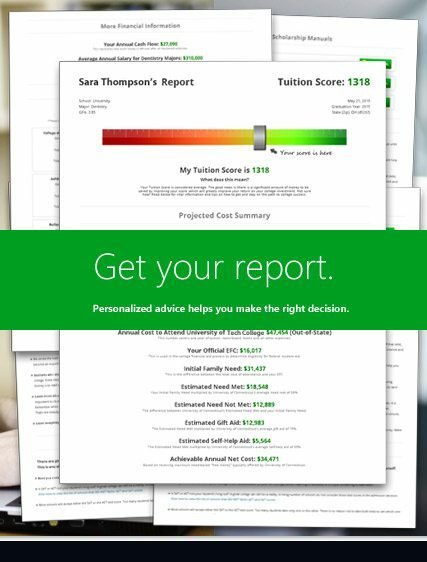 The MyTuitionScore Report guides you, saving you invaluable time and money. You wouldn’t run a marathon without training! The Tuition Score is your training tool for college planning. Both running a marathon and planning for college require hard work, determination, and above all else, preparation. Understanding and learning all about the process, terms, options is the key. Without proper training, families should not expect to get the maximum return on their college investment. From middle school to high school, college preparation is a top priority for families. Getting ready for college is a family effort and can be a grueling and overwhelming process. How can you prepare and guide your kids so that attending the college of their choice is not just a dream, but a reality? My Tuition Score will get your family off to the right start. Already overwhelmed by terms like EFC, CSS and FAFSA? The Tuition Score Report will not only provide your family with these essential numbers... it will explain them. Get our proprietary scholarship and loan manuals, college suggestions based on generosity, distance, and major and much more! "The MyTuitionScore Report taught us more than we could have ever dreamed for this college mountain we need to climb." Spend your invaluable time filling out the right paperwork. Loans, scholarships and schools you may not have known about. More time & money. Less stress. What's better than that? Are you going to borrow money for college? Do you feel prepared for college & the college process? Do you feel college is a good investment? I learned a lot about other colleges that may be available or a better fit, financially and academically. It was also very helpful to see specific job market info related to the major. MyTuitionScore showed me the difference between how much college will cost and the amount of money I will actually save within the next 4 years. It was very eye-opening. The college thing is so expensive and most people don’t seem to know anywhere near enough about it.